The 4th of March is World Read Aloud Day 2015, an event sponsored by LitWorld. 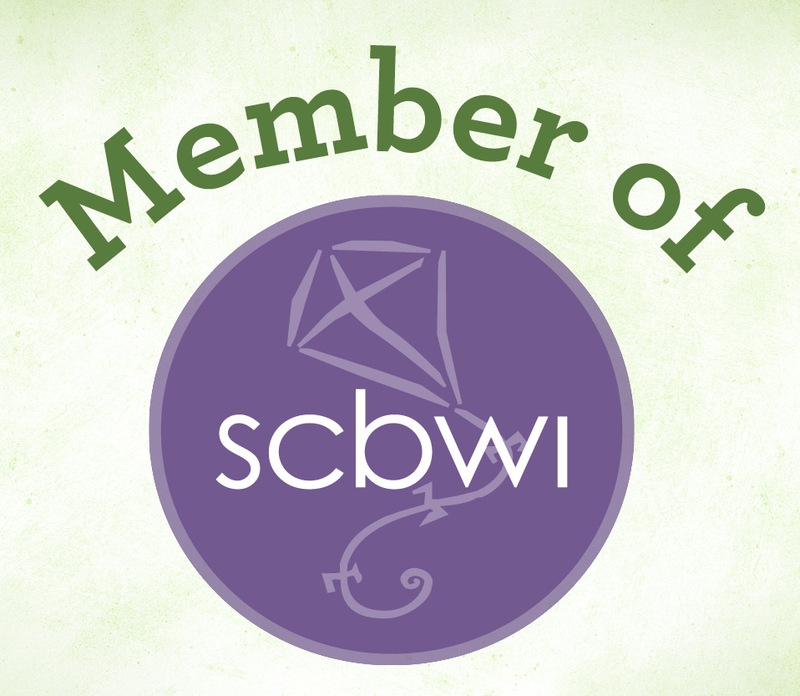 Its aim is to promote literacy as a way of combating poverty and inequality worldwide. For the past week, I’ve been sharing some #WRAD15 inspiration by interviewing Read Aloud experts–teachers, librarians, and children’s writers. Be sure to check out the earlier posts to see their choices for favourite read aloud texts and memories. Read the Ali’s reviews of Karen’s children’s books here and here. “I have so many favourite read aloud books so it’s difficult to choose only one! 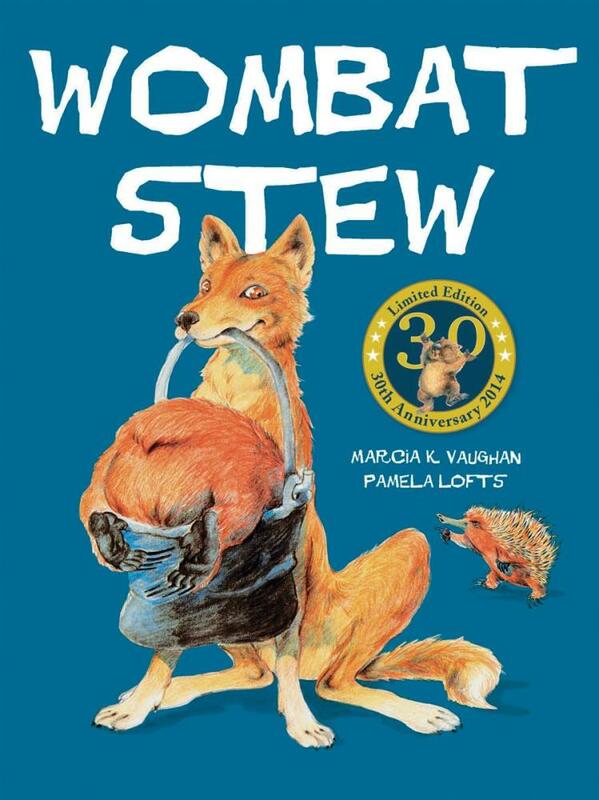 A book that quickly comes to mind is Wombat Stew, written by Marcia Vaughn and illustrated by Pamela Lofts. This book is so wonderful to read aloud. I love the Australian language and bush setting. I love the rhyming, alliteration and assonance used throughout. And I love the beautiful illustrations that bring the characters and story to life. Music has always been a big part of my life, and I enjoy stories that can incorporate music and songs so seamlessly. The Wombat Stew song is entertaining and invites readers to participate. I have fond memories of having this story read aloud to me as a child. 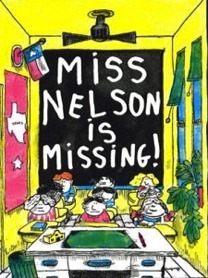 I then went on to read this story every year as a teacher to my grade one students with follow-up activities involving dance and drama – LOTS of fun! Thanks for sharing your favourites, ladies! I bet it was super fun being in your classrooms! Lucky children! After Little Meerkat’s BIG beach adventure, he was ready for something a little more subdued–like jamming with a muso. 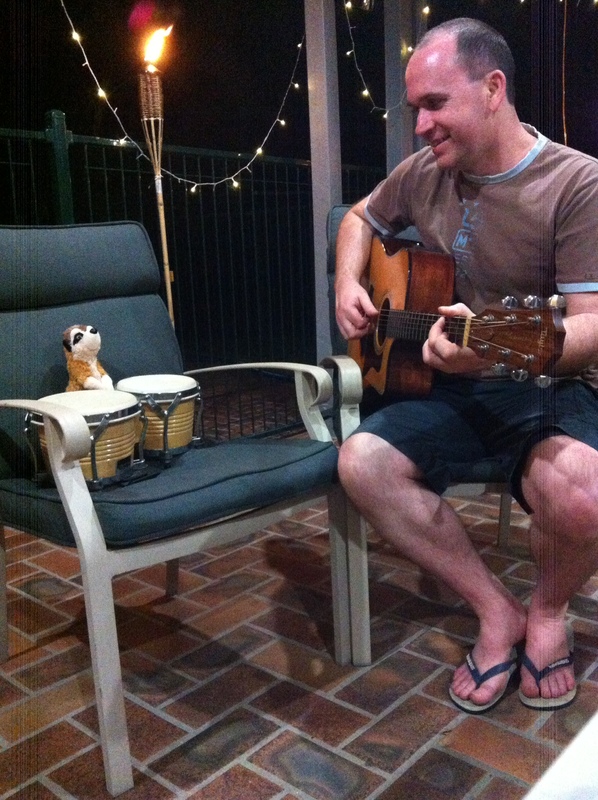 Here he is on bongos accompanying Peter H. They’re playing The Lion Sleeps Tonight, Little Meerkat’s favourite song. 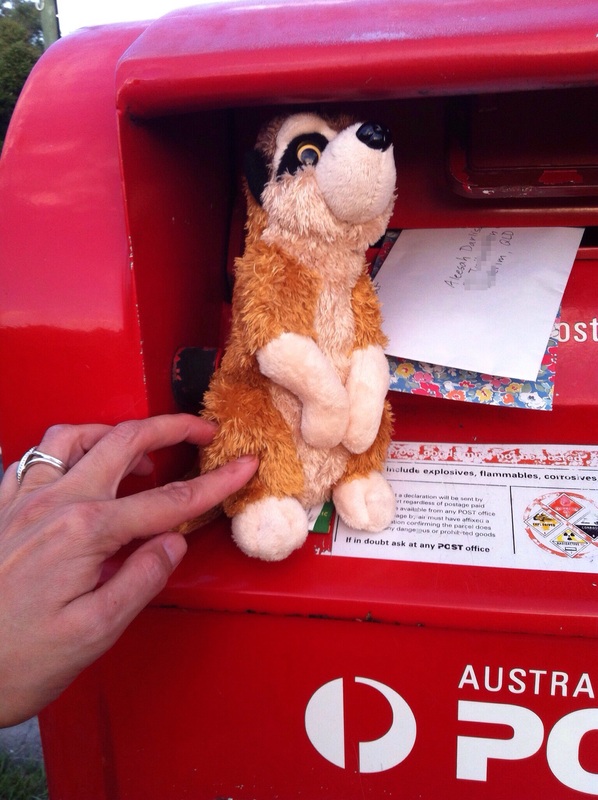 This morning, Little Meerkat was very excited to write a letter to Aleesah. He wrapped his seashell souvenirs in tissue and put them inside the envelope. Sticking the stamp on was his favourite part. He needed a boost to reach the slot on the postbox. Stay tuned for more World Read Aloud Day fun! Be sure to leave a comment telling us your favourite read aloud books and moments! Pleasure Karen! You’re a favourite guest on Spilling Ink. I haven’t read that one Karen, yet. Rachelle, yes loved Wombat Stew – then again, I love stews! 😉 Good one.